The most astonishing building in the world recently reopened. Visitors are allowed to go all the way to the top! After more than a year of renovation work the Atomium has a new face and will give visitors a brand new aesthetic experience by taking them on a very special journey through its spheres. Designed by the engineer André Waterkeyn for the International Exhibition of Brussels, that took place here in 1958, the Atomium is a structure that is half way between sculpture and architecture, symbolising a crystallised molecule of iron by the scale of its atoms, magnified 150 thousand million times. Throughout the ages, man has sought to give architectural expression to his desire for height; towers, pyramids, belfries, cathedrals,… The Atomium, in particular, embodies the audacity of an epoch that seeks to confront the destiny of man with scientific discovery. 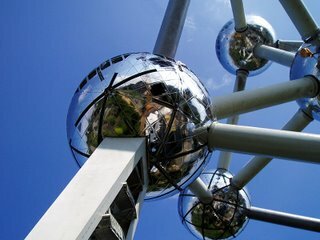 The nine large spheres joined by tubes which comprise the Atomium, are arranged in the configuration of a central cubic system. These spheres, with a diameter of 18 metres, were fitted out by the architects André and Jean Polak. Made entirely of steel clad with aluminium, the structure, at a hight of 102 metres and standing on three enormous bipods, dominates the Heysel plateau. The Atomium was not intended to survive the Exhibition of 1958. Its popularity and success, however, ensured its place as a major landmark on the Brussels skyline.